With a new Optus Cable serrvice and without asking for premium speed service, what download speed should I expect? I am currently getting 5Mbps. 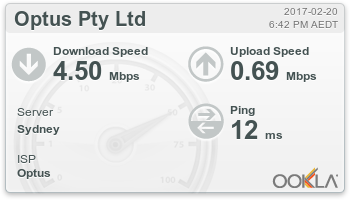 I was with iiNet where I got 8Mbps. My neighbour is with Optus Cable and they get 30Mbps. Is there something in my account that limits the speed or is it a hardware/installation issue? Opinions welcome. Welcome aboard @mrje! Speeds will differ based on several factors. Are you connecting via wifi or Ethernet? What times are you noticing this speed - is it during a specific time frame or always? @mrj4e I'm glad to hear that things seem to be on the mend Please don't hesitate to let us know if you're needing a hand with anything else!